Social marketing. It’s brand-new, word-of-mouth, viral, social networking, blogging, buzzing, consumer-generated media, right? Even people who should know better, like Chris Perry (Sr. VP at PR company Weber Shandwick), who says “he has followed the social marketing movement through the Going Social blog since 2002,” are using the term incorrectly. CMO Magazine (“the resource for marketing executives”) ran a story called “Social Marketing in Four Flavors,” which talks solely about word of mouth, blogs, RSS and podcasting. And the Association of Internet Marketing and Sales is offering an event called “Social Marketing: Tapping Into The Power Of Connected Customers” that is clearly not about bringing about social change, but bigger profits. I have found many other examples as well. Keeping these two marketing subdisciplines distinct and clearly defined is in everyone’s best interest. Imagine the confusion that someone searching for information on blogging or word of mouth marketing would have if they googled “social marketing.” There is not a useful link for miles around in Google distance. Likewise, I am constantly frustrated as I search for others writing on my kind of social marketing in the blogosphere. Everyone is better off if the term keeps the meaning it has had for a quarter century, rather than having the new definition propagate until nobody knows what anyone else is talking about. This is not to say that social marketing does not or should not use the many useful tools offered by social network marketing. But they are not one and the same. So, new “social marketers,” please continue the great work you are doing. But let’s come up with a new term to use – whether it’s “social network marketing,” “consumer-generated media,” “social media,” “word of mouth marketing” or anything else you prefer. But leave us our one small piece of semantic real estate. With the more frequent use of the terms social networking and social bookmarking I can see how the terms have gotten confused. I have used cause marketing in the past. 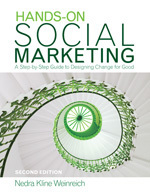 Howabout “change marketing” or “social change” marketing”? I agree. I have also struggled with the confusion about the dual meaning of the term ‘social marketing’. I don’t currently work in the field of social marketing (i.e., using the ‘social change’ meaning), but I have kind of adopted the ‘business ethics’ portion of it as my ‘business philosophy’. I first came across the ‘social change’ meaning of the term through an article in an American Marketing Association’s (AMA) publication, “Marketing Management”, which then led me to the “Journal of Public Policy & Marketing”, which had a Special Issue on Social Marketing Initiatives in Spring 2002. At about the same time I also learned about blogging, also through the American Marketing Association, but this time at a one day seminar called “Blogs: Marketing Beyond the Website”. Since blogging (and RSS, podcasts, etc) has grown so much and so fast in recent years, I’ve resigned myself to the fact the they now have control over the meaning of the term ‘social marketing’. And, I must admint, I will use the term ‘social marketing’ to mean online word-of-mouth marketing myself at times. At the same time though, the term I’ve come to use instead, to represent the original ‘social change’ meaning of the term, is ‘social entrepreneurship’. This term works better for me since I’ve been tending to believe that a blended non-profit with for-profit, or what I call, not-only-for-profit business model might be the most effective way to achieve social change anyway. Just adding my thoughts to the conversation. Great topic! While I like the alternatives you’ve come up with, the field of social marketing has been around for over a quarter of a century and is so established that it will not likely be changing its name. However, the newer use of the phrase is a recent phenomenon and more easily diverted to another term at this point. “Cause marketing” is slightly different from social marketing in that it involves a for-profit company partnering with a non-profit cause with the ultimate goal of increasing the company’s bottom line (and hopefully doing some good at the same time). In social marketing, the beneficiaries are those who are being marketed to or society as a whole. The marketers themselves do not profit from the behavior change. I disagree that the bloggers now have control over the term “social marketing.” When you google the term, it’s clear that the social change definition is significantly more prevalent. However, as time goes on, if we don’t nip it in the bud, it will gain traction. I see your point. I wasn’t thinking about the environment I have been predominately in lately and its influence on my thinking. Within the blogging circle (i.e., bloggers blogging about blogging), many don’t even seem to be aware that there is an alternate meaning to the term “social marketing” (or at least they don’t seem to acknowledge any awareness in their posts). What do you think? Let me know if you think this might help. Thanks for getting in touch and posting a comment to my blog. You raise an interesting point of difference between social marketing, and this new emerging field which has been multiply titled (I usually call it word of mouth marketing). My case is an interesting one because I have the opportunity to work on “your kind of social marketing” as well as word of mouth marketing. And I agree they are not the same thing. But I believe both are signs that the entire marketing discipline (regardless of subgroup) is moving in the same direction – one where connecting with individuals to promote a core belief in a cause, product or service becomes the ultimate goal. It’s not about selling widgets, it’s about connecting with and fostering vocal advocates. That was always the ultimate goal of social marketing – something a wider range of marketers are now beginning to realize. I’ll post more on this topic on my blog soon. I have sent a link to the post to several “big name” bloggers, and received a few comments from them by e-mail, but not much on their blogs. I’d love for you to invite others into the conversation as well. Thanks for adding your enthusiasm and blog post to this issue! Thanks for your comments. I agree that the fields of social marketing and word of mouth marketing need to work together. I was glad to see the post on your blog about this topic. Thanks for this post Nedra. I referenced it in a comment regarding a post I did about social critiques of peer-to-peer marketing initiatives. I read your comments and it’s interesting how we all have different opinion about what social media/marketing is. I believe that the starting point for the for-profit marketers use the term ‘social’ because the massage/content/distribution is not controlled by any corporation and is created and controlled by the public/sociaty/community. In your case, it refers to the effect and objective of the marketing message – to create a social change/movement – so marketing for social change might be a much better term. Don’t you think this can be a hit or miss? But, when it works, you can come away with real results. There are tons of opportunities out there, but the new need to be open to spot something that’s just under your nose!